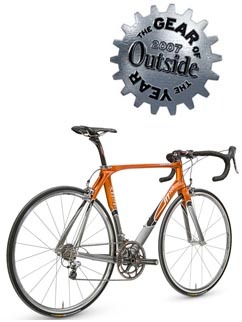 Kestrel Bicycles of Santa Cruz, CA, announced today that its new RT700 road model has received coveted "Road Bike Gear of the Year" honors from the editors of Outside Magazine. The 2007 Gear of the Year awards are featured in Outside's Spring Buyer's Guide, which hit newsstands on April 24th. "We are absolutely honored that the RT700 has been selected as Gear of the Year," said Kestrel president, Kevin Kenney. "In designing the RT700, we pulled out all the stops in putting our 20-plus years of carbon frame experience to work to develop the best performing, best riding road bike in a hotly competitive market segment. As a result, for the majority of riders out there it's the best all-around road machine we've ever made. To have this acknowledged by a national publication of Outside's caliber is a testament to all the thought and hard work that our dedicated team here in Santa Cruz puts into every Kestrel product," Kenney added. "On everything from all-day crushers to quick little hill climbs, we dropped more riding partners than ever before. But none will turn friends into enemies faster than this year's Gear of the Year winner, the so-swoopy-it-hurts Kestrel RT700." "The RT700 was the most agile and responsive bike we tested this year." "If you want a bike that can handle twitchy criteriums and, with a set of aero bars, the occasional triathlon, this is it." "Twenty-one years after introducing the world's first all-carbon production frame, Kestrel continues to put a premium on stiffness and aerodynamics...[T]he RT700 loves to climb and descend; plus it's comfy enough for long-haul speed." As part of the Gear of the Year selection, Kestrel will participate in Outside's upcoming "Stay 30 Forever Tour", which will visit three major western U.S. markets later this month. The Kestrel RT700 bike will be on display in a special Buyer's Guide tent, along with the winners in other gear categories. The tour will visit San Francisco's Marina Green on May 12th, Portland's Pioneer Courthouse Square on May 19th, and Washington Park in Denver on May 26th. Sandpoint Design Inc., dba Kestrel Bicycles, is a leading manufacturer of high performance carbon-fiber composite bicycle frames, forks and components for road, off-road, and multisport use since 1987. The company's products are marketed under the Kestrel® brand name domestically and internationally. Kestrel is a pioneer in the production of composite bicycle frames and forks and is responsible for many of the industry's technical innovations including the first all-carbon fiber frame, the first all carbon mountain bike, the first modern full-suspension mountain bike design, the first use of aerodynamic tube sections in a production bicycle, and the first carbon fiber road fork. Kestrel's corporate offices are located at: 5300 Soquel Avenue, Suite 101, Santa Cruz, CA, 95062. More information is available on-line at www.kestrel-usa.com or by e-mail to info@kestrel-usa.com. Outside is America's leading active lifestyle magazine, with over two million readers a month. For 30 years, we've been dedicated to covering travel, sports, adventure, health and fitness, as well as the personalities, the environment, and the style and culture of the world outside. Along with many other accolades, Outside is the only magazine to receive three consecutive National Magazine Awards for General Excellence. Please visit us at www.outsideonline.com.